Last summer, the Fleet 5 Long Island Sound cruise committee decided it was time to revisit Narragansett Bay. To make it interesting, we coordinated the cruise around the WaterFire festival in Providence, RI. Eleven Fleet 5 LIS boats participated in this cruise, including Bob & Marilynn’s The Usual Suspects, Ken & Heather’s Raison D’Etre, Len & Charlotte’s Gone With The Wind, Ed & Kathy’s Celtic Voyager, Bob & Marilyn’s Snowflake II, David & Naomi’s Shalvah, Christian & Marie’s SPIRIT, John & Linda’s Shenanigans, Stanley & Julie’s Frog Prince, Cheryl & Elwin’s Enchante’, and Grif & Carol’s Paramour. Once again, the cruise commenced with a “kick off” dinner at the Stonington Harbor Yacht Club in Stonington, CT. With its perfect location at the eastern end of Fishers Island Sound and its unmatched nautical ambiance, SHYC is the ideal place to start a summer voyage. The cruisers assembled in Stonington Harbor throughout the afternoon on the first Sunday after July 4th. Things tend to quiet down a little after the holiday, creatingmore peaceful layovers and certainly making it easier to get moorings and dock space. As the sun crossed the yardarms, the Fleet 5 cruisers assembled in the club’s bar for the usual rounds of tall drinks and even taller stories. Newcomers were welcomed and old friends toasted the start of another sailing season. There was high optimism that after a washed-out June, the worst was behind us and we’d have fair winds and smooth seas for the rest of the summer. Dinner followed the cocktail hour and, as usual, Chris Manfredi and his staff at SHYC were perfect hosts. We enjoyed a sit-down dinner and, after dessert and coffee, we got down to the business at hand. The custom-designed tee shirts were handed out and each participating boat received a cruise gift of a propane fired mini-torch (they’re great when cutting lines to prevent fraying). Then it was time to distribute the float plan, discuss details and make sure everyone was coordinated for the scheduled activities. Of course, plans and details related to crew safety were emphasized. The cruise commenced in earnest at 8:00 am the next morning. Mooring lines were dropped and we headed out for our first destination – three nights at picturesque Block Island. Most cruisers opted for the Watch Hill Passage route but a few of us saved a little time by cutting through Lord’s Passage. Either way, we had sails up by 8:30 and made most of the passage under sail in moderate southwest winds. The weather was great and you couldn’t ask for a better start to a summer cruise. Everyone arrived at New Harbor by 12:30. Those who wanted to “drop the hook” had plenty of room and the rest of us picked up moorings. Some went ashore to partake in the limitless activities that Block has to offer. Others decided it was a perfect day to relax aboard and take a much-needed midafternoon nap. After all, we had to save our energy for all the scheduled partying. As late afternoon approached, there were impromptu cocktail parties aboard several boats followed by the new Fleet 5 tradition of “get aquatinted” potluck dinners. Several boats served as hosts for two or three other couples who bring their favorite dish to share. Guests are drawn at random, so you never know who you’ll be sharing a meal with. It’s a wonderful, friendly way to get to know your fellow cruisers. Tuesday was cloudy, but that didn’t deter the hardy souls who awoke early to join the annual clam hunt. While the rest of us waited for Aldo, Bob Aymar (The Usual Suspects) determined band. Their timing was perfect because the clam beds were going to close the next day for an extended period. They were not as successful as last year, but still had more than enough for Bob and Marilyn to host their “clam extravaganza” that night. As usual, Bob created his famous white clam sauce and linguini dinner, and everyone enjoyed an evening of good drinks, good conversation and great food. Wednesday was a mix of sun and clouds but no rain. Most of us took the opportunity to get ashore. Some of us rented bikes to explore the island and some hiked into town. There are many shops that must be visited and wonderful restaurants overlooking the ocean! Afternoon saw the rendezvous at The Oar (you can’t go to Block and not stop at The Oar! ), followed by dinners aboard or at one of the nearby restaurants. Thursday morning we awoke to threatening weather reports and heavy overcast. After a group radio call, it was decided that we’d head to our next port-of-call, Dutch Harbor in Narragansett Bay. By 9:00 am we were all underway for the 25 nm passage and, although there were reports of scattered storms around us, we arrived at Dutch Harbor safe and dry. Dutch Harbor is a great stopover. It’s easy to get in and out and there are lots of moorings. The immediate area is quiet and picturesque – great for a leisurely stroll ashore or a brisk walk over to Jamestown. A complete (and pleasant) surprise was the go rmet Mexican restaurant we found in a tiny shack at the head of the dock. Cruisers dinghied about and visited each other. Later in the afternoon, the partying began in earnest – Chris Nitzsche and Marie Genteale (Spirit) hosted a wonderful cocktail party that rolled into dinner and then more partying after that. Friday morning saw improved weather and we headed out to East Greenwich near the northern end of the Narragansett. It was less than 10 nm so most of us didn’t bother with the sails and just motored through the quiet waters into East Greenwich Bay arriving before lunch. Everyone opted for slips at Norton’s Marina because we were going to be spending so much time ashore and by mid-afternoon, the cocktail parties were in full swing. Saturday was bright and sunny, and many took the opportunity to explore the beautiful town of East Greenwich which is just a couple blocks from the marina. It’s a quaint town with old neighborhoods, a main street that’s a throwback to another era and (best of all) laundromats – some of us had been out for two weeks by this time! By early afternoon, we were back at the marina preparing for the main event of the cruise – the WaterFire Festival in Providence. The evening started with a group dinner at nearby Pal’s restaurant. A local favorite, they specialize in Italian and they provide great food and service at very reasonable prices. After dinner, we broke into small groups and hopped in cabs for the trip to Providence. The WaterFire Festival is a local tradition that takes place several times throughout the summer. Dozens of floating bonfires are lit in a canal system that meanders through the downtown district. They’re kept burning late into the evening, with dramatic music playing in the background. In addition, there are bands to dance to, street performers to watch and lots of vendors. It’s a great way to spend a warm summer evening. Sunday morning was hot and muggy – but no rain! Our next port, Bristol, was only 13 nm away so everyone had a leisurely breakfast and departed in the late morning. 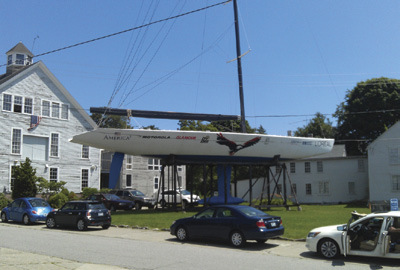 We picked up moorings at the Bristol Yacht Club, took a quick swim, and then headed for the Herreshoff Marine Museum & America’s Cup Hall of Fame at the south end of town. If you haven’t been there, this is definitely a place to put on your “must see” list – there’s history, artifacts, documentary movies and lots of Herreshoff boats to see. Monday was a quiet day to stroll around town, relax aboard and (again) take a dip because the weather was definitely getting hot! That evening, port hosts Stanley and Julie Ross (Frog Prince) arranged for a catered dinner at the Bristol Yacht Club. We met in the bar (where else?) for cocktail hour and had a wonderful dinner on the porch overlooking the harbor – the sun was setting, it cooled off a little and was just a perfect ambiance! Tuesday morning it was time to bid a farewell to Bristol and make the short journey down the Narragansett to Newport. Most of the fleet picked up moorings at Ida Lewis Yacht Club. It’s a wonderful location close to town, served by the launch service with a close-up view of the New York Yacht Club grounds. Port hosts Grif and Carol Walling (Paramour) hosted the afternoon cocktail party. Most of the fleet went ashore Wednesday morning to take in the sights of bustling Newport. We met in the late morning to rent scooters and explore. It was great fun, even if we did seem to cover the same territory several times! Lunch ashore was followed by more shopping, and then Grif and Carol arranged for a lovely dinner at the Moorings restaurant. Newport is a destination that just never seems to get old! By Thursday things were winding down, and several boats began departing for home. Other cruisers remained in Newport to continue the adventures in the waters to the east…but that’s a story for another time. Ed Brown has been sailing for over 50 years. He and his wife Kathleen spend their summers aboard their Catalina 445 Celtic Voyager. 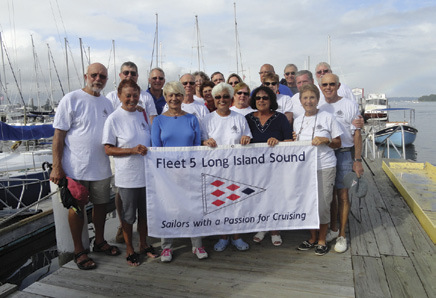 Our 2014 Fleet 5 LIS summer cruise is to Edgartown, MA. We will visit Watch Hill, Jamestown, Cuttyhunk, Edgartown, Quissett, Newport and Stonington. The cruise will feature these principles: Keep it simple; keep it casual; Reunite old friends and forge new friendships; a focus on water-based activities over shore-based activities. Fleet 5 Long Island Sound is pleased to announce a new membership program. New members will be charged only $10 for the first year of membership. Regular dues will be paid in all years thereafter. New members will have all the rights and privileges of membership, except that they will receive their burgee when they begin paying regular dues (unless they wish to purchase one in their first year). We can use helping hands with organizing, hosting and participating in our activities. We offer various organized events, rendezvous, an exciting summer cruise, mooring capability and can help with technical support. You will also meet new sailing friends and have the ability to travel to new destinations. To quickly expand your circle of nautical friendship, log onto fleet5lis.org/Membership/ MembershipNew.htm and pay your $10 via PayPal or check.